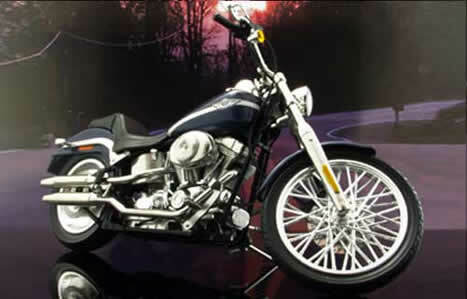 HARLEY DAVIDSON ® FUEL MANAGEMENT BY COBRA Online@ AllJet.com/ORDER TODAY! Our new Fi2000R functions the same as the standard Fi2000 and the R version comes with connectors that snap directly into the bike's fuel injector bodies, making the installation even easier than before. The model-specific Fi2000R features three adjustment screws, called pots, which are preset for the make and model. Two pots adjust low speed and mid-range settings that should take care of most lean air/fuel mixture problems. The Fi2000R also has a third adjustment for high range that functions much like a main jet on a carburetor. This third tuning option is for use with engines that have high flow air filters and or extensive modifications such as big-bore kits, higher compression or other performance increases where more fuel is required in order for the engine to run properly in full-throttle positions. Because the Fi2000R is designed to eliminate the low rpm lean air/fuel mixtures (just like the Fi2000), it does not increase maximum horsepower, though in most cases it does provide a smoother power curve and improved rideability across a wide rpm range. The Fi2000R installs quickly and easily, usually in under 60 minutes, and comes with detailed tuning instructions. There are no computer settings to make nor Internet downloads to configure. 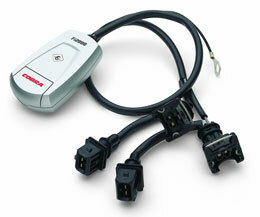 It's a simple plug-n-play installation that improves the overall rideability of a lean motorcycle immediately. Due to stringent emissions requirements, most modern day motorcycles arrive from the factory with lean air/fuel settings. Once a rider installs an aftermarket exhaust system or air filter, the engine flows more air, potentially leaning out the mixture even more than the stock settings. This can lead to conditions such as overheating, backfiring on deceleration, hesitation on acceleration, or an uneven idle. Unfortunately, most motorcyclists seem confused about how to correct lean air/fuel mixtures when it comes to fuel injected engines. Cobra's Fi2000 and Fi2000R digital fuel processors supply the solution. Think of this product as a digital jet kit, giving tuners and home mechanics the product needed to fine tune FI engines quickly, easily, and economically.